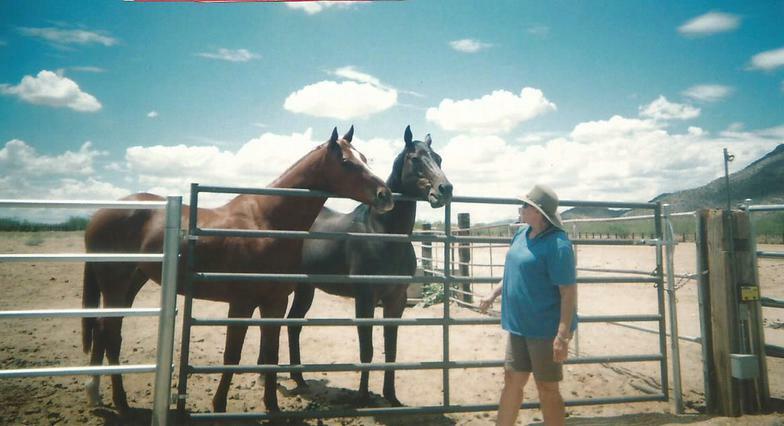 Former horse trainer Patti Shirley cares for racehorses past their prime. The racehorses who run in Triple Crown races, including the wonderful Animal Kingdom who won the Kentucky Derby in 2011, don't always have such a wonderful life after the race. Patti Shirley once raised racehorses. Now she tries to give them a comfortable retirement. It's a monumental task. 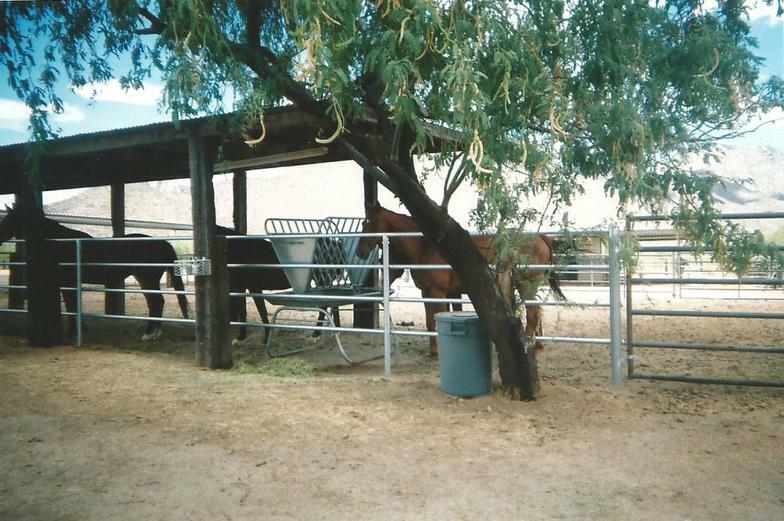 All our horses came straight from various racetracks in Arizona and New Mexico and arrived in excellent condition, except for the injuries which ended their careers. Our challenging assignment is to provide for them for the rest of their lives. With excellent care, they can live to be 30 years old. 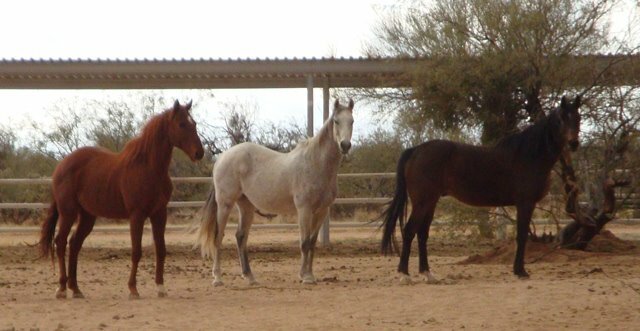 These horses are not available for adoption, they are retired and will remain here on this facility for the rest of their lives. It's been said that "it's not WHAT you know but WHO you know that counts". Garth Brooks has friends "in low places" but Equine Encore Foundation has friends in the real estate business. We think our friends are better! Long Realty's Rebecca Gorrell is donating a portion of her commission for all of her real estate sales or purchases to us in the name of her clients. She's doing this because she "just loves that Equine Encore Foundation is providing a retirement home for so many wonderful horses". If you want to support us and you have a house to sell or are looking for a new home in the Tucson area, please contact Rebecca. She can be reached by email at rgorrell@longrealty.com, by phone at (520) 975-9616 or (800) 328-1575. 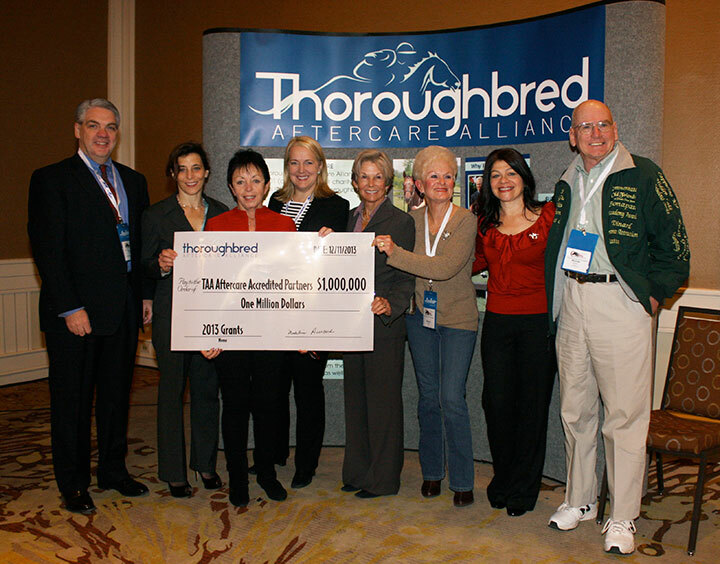 Tucson, Ariz. – December 11, 2013 – Madeline Auerbach, Board Vice President of the Thoroughbred Aftercare Alliance (TAA), announced today that the TAA has awarded a total of $1,000,000 in grants to its 23 accredited facilities. Auerbach, joined by TAA Executive Director James Hastie and several other TAA Board members in attendance, made the announcement today at the 2013 Global Symposium on Racing & Gaming, presented by the University of Arizona’s Race Track Industry Program, at the Westin La Paloma Resort in Tucson, Ariz.
HALLANDALE BEACH, FL - The Thoroughbred Aftercare Program at Gulfstream Park announced today it has allocated $100,000 to the Thoroughbred Aftercare Alliance (TAA) to be distributed to accredited aftercare facilities, including Florida Thoroughbred Retirement and Adoptive Care. "The TAA has done an outstanding job in a very short time helping our industry provide long-term care for retired Thoroughbreds," said Gulfstream Park President Tim Ritvo. "The accreditation system for aftercare facilities assures all of us in the industry that funding will go directly to the horses. By working with the TAA we can be sure that our retired equine athletes have the chance at second careers, safe environments and loving homes." Said TAA Executive Director James Hastie: "On behalf of TAA's accredited aftercare partners and the Thoroughbreds under their care, I am very pleased to accept this generous gift from the Thoroughbred Aftercare Program at Gulfstream Park. The Stronach Group was one of the first to recognize the need for an industry-wide approach to aftercare and we are grateful for their expanded support." Gulfstream Park's eight-decade commitment to giving back to the Thoroughbred community through philanthropic partnerships, donations and outreach programs endures at the local and national levels. More than $250,000 has been raised the past two years through charitable events to support Thoroughbred aftercare organizations and the Permanently Disabled Jockeys Fund. We appreciate the grants we have received from Blue Horse Charities and from Thoroughbred Charities of America! 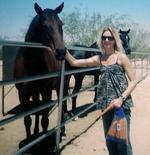 You can see the original letter from Blue Horse Charities here! Thank you Bridget Grobosky for your publication! Please read her article and watch her video here! 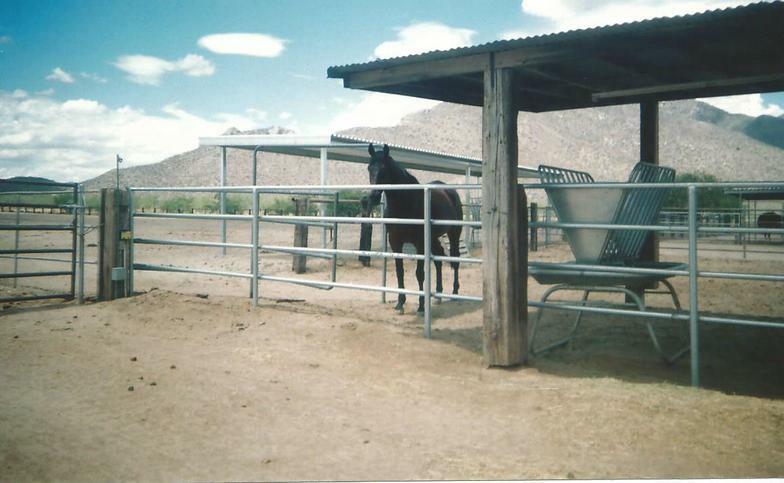 Thanks to grants from the Arizona Horse Lovers Fund and the Brennan Equine Welfare Fund we were able to install new pipe fencing! To find out more about the Brennan Equine Welfare Fund please click here! Patti Shirley was nominated for a merit award presented by Thoroughbred Charities of America! spirits have deserted them. In the "blue corner" we had Dignified Donovan and Ohnogottogo. Their opponents in the "red corner" were Smoocher and Chief Arias. Grease Spot and Captain Ron established themselves as referees in this daily contest. In order to keep the peace and keep all of the horses safe, it was important that everyone stay in their own areas and that the fence remain intact. We named this project PLEASE FENCE ME IN and started looking for help. Biff Baker Fence Company was willing to fortify the fence and the project was funded in part by a grant from Brennan Equine Welfare Fund of The Greater Cincinnati Foundation. Thanks to these folks we once again have a strong fence and it's true that "a good fence makes good neighbors"! Please read about our funding benefactor at www.brennanequinewelfarefund.com. helped us again! Read more about the fence demolition project below. We are honored that Thoroughbred Charities of America (TCA) has determined that we provide a better life for Thoroughbreds after their racing careers are over and has awarded us a grant for 2016. Grants like this one enable us to provide a good life for our 80 residents. The Brennan Equine Welfare Fund of The Greater Cincinnati Foundation has again come to the rescue of Equine Encore Foundation! Our property was under siege from hungry free range cattle who were breaking down our fences and eating our horses' hay. Thanks to a grant received from these folks, we were able to electrify our outside perimeter fencing and FENCE OUT THE COWS! Both the people and the horses at Equine Encore Foundation are very thankful to The Brennan Equine Welfare Fund of The Greater Cincinnati Foundation for saving our hay! It seems that every year we are faced with some kind of crisis, and the Brennan Equine Welfare Fund of The Greater Cincinnati Foundation always comes to our rescue! This year we found ourselves with a lovely pregnant Thoroughbred mare. No foals have been born on our property for over 20 years so we had a lot of work to do. 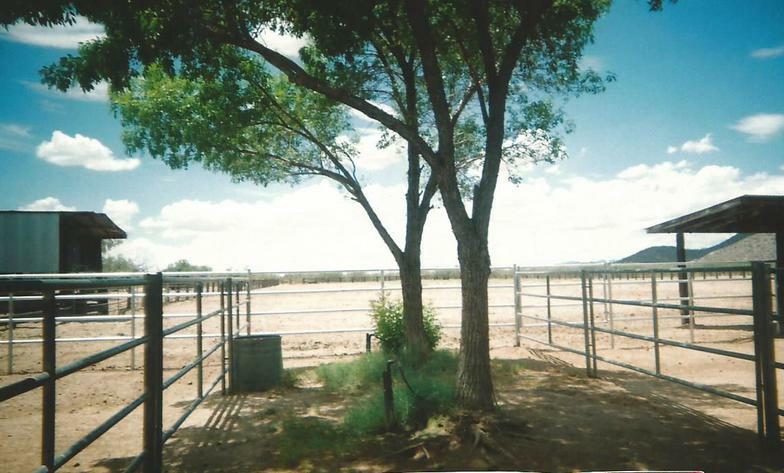 We had a large paddock that would do nicely as a delivery room but plywood panels had to be purchased and attached to the pipe fencing so that the baby could not accidentally slip through the fence. We also needed to purchase a monitoring system so that we could be on hand to make sure the delivery went smoothly and to tend to the foal after birth. Thoroughbreds should never foal unattended! The new foal's navel needs to be cleaned with Betadine to prevent infection and the foal needs to be given one or more enemas to make sure that all of the meconium has passed. Our precious chestnut filly arrived at 1:30 A.M. on May 14, 2018, and we were ready for her arrival thanks to the help we received from the Brennan folks! Many thanks from all of us at Equine Encore Foundation!